Irish singer/songwriter Luka Bloom looks back on his career in an unusual way on Dreams In America. Instead of revisiting the finest moments from his two-decades-plus catalog in a run-of-the-mill anthology of old album cuts, he decided to devote Dreams In America to creating vibrant new versions of songs from his previous releases. In a strictly solo-acoustic format, Bloom breathes new life into a batch of previously recorded songs. From the breathless narrative of 'The Acoustic Motorbike', which blends stream-of-consciousness beat poetry with rap-like momentum over an urgent strum, to the title track, a poignant ballad of love and distance, he makes it clear that these songs aren’t just part of his history. They’re very much a part of his present as well. There are a few live, band-accompanied tracks thrown in for good measure, including the folky 'Sunny Sailor Boy', which gets Bloom’s audience singing along, and 'Love Is a Monsoon', a pulsing tune full of rich imagery. The one new song here is ironically the album's oldest song - it's Bloom's version of the traditional folk ballad 'Lord Franklin', to which he lends an almost impressionistic feel. In the end, Dreams In America shows Luka Bloom to have a history that’s worth celebrating. Irish Troubadour brings it all back home. Over the past twenty years, few performers have turned out such consistently mesmerising music as Luka Bloom. His literate songs are invariably imbued with observations of what goes on under the skin of human behavior, and he can turn in a catchy tune too. But for this album, Bloom has pressed the pause button. He’s retreated to his living room to cast an uncharacteristically nostalgic look over his shoulder by re-recording and revitalizing a selection of songs from his illustrious past. Although not intended as a "best of", Dreams In America contains such gems from his back pages as the plaintive ‘Ciara’, the sublime ‘See You Soon’ and a deliciously delicate version of ‘Black Is the Colour’. The title track has a drone effect that gives it a hypnotic eastern tinge. On ‘The Acoustic Motorbike’ and ‘Bridge of Sorrow’, Bloom slips into the hypnotic folk-rap style he made his own, and with ‘Love Is A Place I Dream Of’ he evokes the pathos of Leonard Cohen. The one new track is a straight version of ‘Lord Franklin’ in honour of Micheál O’Dómhnaill, and there are bonus live tracks, most notably a sparkling ‘Sunny Sailor Boy’. That he scales such emotional heights with just his voice, a guitar and a bagful of heartfelt songs makes Bloom’s achievements even more remarkable. Pressing the pause button is not, by his own admission, something Luka Bloom normally does, and this retrospective, 20 years after his breakthrough ( Riverside ), is no sepia-tinted collection. Its broad sweep offers snapshots of Bloom's music in all its varied shades. His trademark propulsive guitar still distinguishes Bloom on the title track and The Acoustic Motorbike , but it's the more subtle string picking that stands out, acting as a foil to a genteel cover of Lord Franklin and on the beautifully restrained See You Soon. Not your run-of-the-mill record company compilation, Dreams in America showcases songs from Bloom’s 20-plus years as a solo performer, going back to early favourites like 'The Acoustic Motorbike'. Bloom, a dynamic live performer, has chosen to revisit these tunes in live solo acoustic and full band recordings. An underrated guitarist, Bloom’s use of open-tuned strings gives a sonic boost to the songs. Bloom’s roots in the Irish traditional scene are acknowledged with versions of 'Black is the Colour' and an unreleased cover of the classic old ballad 'Lord Franklin'. Perennially in brother Christy Moore's shadow, Luka Bloom shows on this collection that the past two decades - since changing his name and leaving Ireland for the US - have been time well spent. An unconventional greatest hits package, 12 studio classics have been redone in an intimate solo-acoustic format. The oft-covered Black is the Colour could well be Bloom's own, while Love is a Place I Dream Of loses little of its magic, even with Sinead O'Connor's absence. Bloom's clean guitar strums, masculine Irish brogue and twinkling tales of love, landscape and reminiscence sustain the listener throughout. Three live tracks, including the lovely, violin-backed I hear Her Like Lorelei and Sunny Sailor Boy, cap an enduring journey. Key Track: Folk ballad Lord Franklin sounds beautiful anew. Irish singer/songwriter and all around nice guy Luka Bloom is those one of those artists you always feel conflicted over - you want him to get the success he deserves and become huge, but you also want to keep him all to yourself. He's also someone who is somewhat allergic to nostalgia; in a career spanning more than 20 years, he's always pushed forever forward, never looking back. Which brings us to 'Dreams In America', which is not a best of compilation. Rather, it is a series of re-recordings of songs from Bloom's last 10 records, and one new song, an arrangement of the traditional Lord Franklin (and mighty pretty it is too). The template here has been to strip every song back to its bones, with most of the tracks being simply Bloom and his trusty nylon string guitar. While initially you might find yourself missing the lush orchestration of earlier recordings, after a few tracks it becomes clear that this is the best way to experience Bloom. Somehow, at their most basic these songs manage to become even more intimate, even more personal, despite (or perhaps because) Bloom has performed them hundreds, if not thousands of times since their release. Thus we have the achingly beautiful See You Soon and the gorgeous Love Is A Place I Dream Of, both raw and wonderfully melodic. Elsewhere, the uplifting Cold Comfort and the delicate arrangement of traditional tune Black Is The Colour showcase both Bloom's eclecticism and his intricate, criminally underrated guitar playing. The collection is rounded out with three live recordings, including a version of I Hear Her, Like Lorelei with a string section which could well stop your heart with its beauty. If you love Bloom, this collection will reaffirm your suspicions of the man's genius, and if you're unfamiliar with him, I could think of no better place to start than this utterly charming recording. Revered Irish singer songwriter and Christy Moore's younger brother Luka Bloom presents a record of old songs via a new format on his latest cut, Dreams In America. The soulful folk artist has chosen a range of songs from his back catalogue and turned them on their heads, creating a strictly solo-acoustic new batch of beauties. Completely revamping the tunes, ranging from the poetic rap of 'The Acoustic Motorbike', 'Love Is A Monsoon' (presented live), 'Sunny Sailor Boy' (also live with crowd involvement) and 'Ciara', all songs have been re-interpreted to suit the modern day Luka Bloom and the way he now hears them. The result is a soothing 15-track storytelling opus that highlights the two Bloom strengths; his affecting, warm vocals and the fingerpicking style he's made his own since the late 1970's. The re-energised 'Cold Comfort' from 1994 record Turf finds Bloom singing the number in a more dulcet manner and live tracks such as 'I Hear Her, Like Lorelei' from last year's Eleven Songs, follow the same path. Bloom's conversational style is interspersed with sweeping strings and his trademark Spanish guitar flourishes, coupled with gentle percussive brushstrokes. Brilliant. Dreams In America demonstrates Bloom's dedication to his craft above all. Not simply content to allow the songs of the past to be passed through untouched, he still finds ways to improve their quality, 'Black Is The Colour' from'94's Turf being case in point. Bloom using the more streamlined Spanish guitar feel over the scratchy and tinny steel-strung electric acoustics of days gone by to paint a whole different picture here. Luka Bloom not only looks back on Dreams In America, he looks deep into the future. 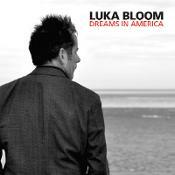 Dreams In America is a cracking title for a Luka Bloom album for, despite his Irish brogue, there's always a sense of the homesick Irish immigrant in the songs he writes. Revisiting a selection of killer stage staples such as The Acoustic Motorbike, and some unexpected album tracks, Bloom presents a retrospective of his work by performing them again with some imaginative but subtle enhancements. His unique vocal style - warm folk tones that are stretched ever so slightly into unlikely pitches and places (note the way he warbles the word "dreams" on the title track) - is a simple lesson in precision of delivery as he illustrates normality's intriguing, and occasionally disturbing, ways. With a lengthy career that has seen him tour and record with consistent success, he appears to pay scant regard to changes in the music world. Apart from his stream of consciousness rapping on the melodramatic Bridge Of Sorrow his style is that of the wandering troubadour. The storyteller with an uncanny knack for touching on the essence of humanity and its quest for warmth and comfort. Dreams In America is a veritable treasure trove of memorable pleasures that deserves nothing but unconditional recommendation. Enjoy it, then investigate further.